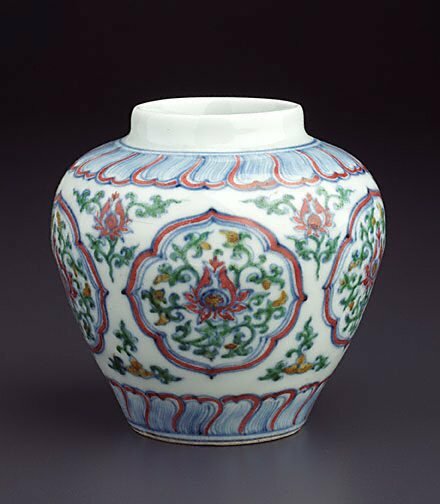 Imperial porcelain of the Chenghua period is esteemed for the purity and quality of the porcelain clay, the innovation and delicacy of design and the perfection of the ‘doucai’ (‘contrasting colours’) technique. This technique, in which overglaze enamels are applied to a design delineated in underglaze blue, must have been difficult and expensive for it is confined to small, intimate objects of exquisite refinement. So esteemed was Chenghua ‘doucai’ that it was copied in succeeding centuries, most notably in the 1700s as demonstrated in the gallery’s delicate example of the famous ‘chicken cup’ type (Acc.no. 193.1992). The six-character mark on the base of the jar indicates it was made before 1481, when the single character for 'heaven' replaced the reign mark. The freely drawn underglaze blue outlines are clearly visible beneath the adeptly applied overglaze enamels of iron red, green and dark yellow. This rare example has a companion piece (with cover) in the Palace Museum in Beijing, but few other examples exist of this important type of early 'doucai' decoration.